WONDERFUL 2 BEDROOM & 2 1/2 BATH LOFT STYLE, NICELY CUSTOMIZED END UNIT. LOCATED IN COVETED COBB COUNTY AREA, OFF POWERS FERRY RD. NEW HVAC, NEW WOOD LAMINATE IN GREAT ROOM, WOOD BURNING F/P, FRENCH DOORS TO PRIVATE PATIO AREA. KITCHEN HAS GRANITE, OPEN SHELVES & NICELY UPDATED CABINETS, KEG-ERATOR IN BAR AREA. BEAUTIFUL POWDER ROOM ON MAIN LEVEL, SECOND BEDROOM OPEN TO LOFT STAIRCASE, GENEROUS CLOSET & PRIVATE BATHROOM. 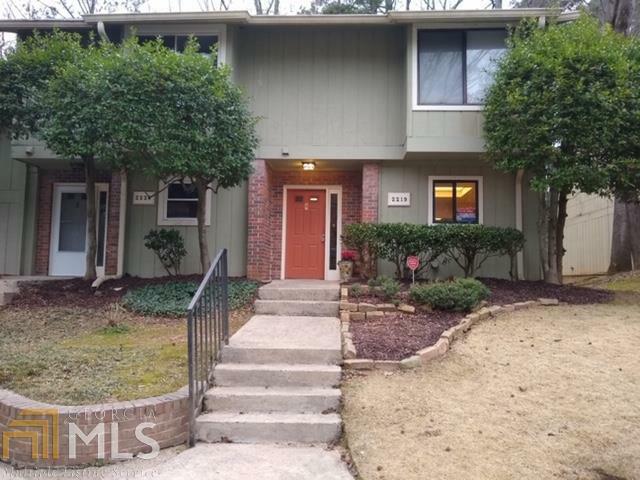 LARGE MASTER HAS SLIDERS TO TILED BALCONY OVERLOOKING WOODED AREA, CUSTOM SLATE/STONE SHOWER, HUGE LINEN CLOSET & OVERSIZED WALK IN CLOSET. THREE TALL WINDOWS ALLOW NATURAL LIGHT INTO DINING/KITCHEN AREA. CLOSE TO PARK LIKE AREA NEAR CLUBHOUSE.POOL & TENNIS. CONVENIENT TO INTERSTATE, SHOPPING & DINING. THIS ONE WON&apos;T LAST LONG! Directions: From North: Take I-75 Exit #263. Go Left & Cross Over 75. Then Take Next Right Onto Powers Ferry Road. Go 1.5 Miles & Turn Into Covered Bridge (At Chads Ferry Road). Go Straight Into The Community To Surrey Court. Turn Right & Unit Will Be On Left.